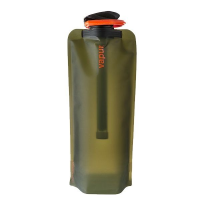 Vapur Element Water Bottle - 18 fl. oz. In addition to paying homage to the Emerald City, the 18 fl. oz. Vapur Element water bottle is reusable, foldable, attachable, freezable, sustainable, convenient, streamlined and easy to grip. Vapur Camp & Hike Microfilter W 1l Eclipse Olive 40017. The Vapur MicroFilter safely removes 99.9999percent of waterborne bacteria (such as Salmonella Cholera and E. coli) and 99.9percent of protozoa (including Cryptosporidium and Giardia).